I planned to visit the Moody Nature Preserve over Thanksgiving break, but I changed my mind because I hate driving. Instead, I went to The Silver Bluff Audubon Center near Silver Bluff, South Carolina. It was a 45 minute drive from my house vs. a 3 hour drive to the Moody Preserve. The shorter distance beat sitting in a car half the day. The SBAC is located in the boondocks. Silver Bluff Road runs off Old Jackson Highway, an area of second growth forest, agricultural land, and factories. The latter are located here to take advantage of the state’s anti-union oppression. A large wheat field borders the bird sanctuary. The last 2 miles of Silver Bluff Road consists of unpaved but well graded dirt. The road leads to the Savannah River but to reach the hiking trails it’s only necessary to drive about half that distance. Map of the SBAC. I hiked the Tanager Loop Trail. It’s supposed to be about 2 miles, but I think it’s slightly longer than that. The Tanager Trail is well marked and easy to follow. This ancient dwelling is near the beginning of Tanager Trail. 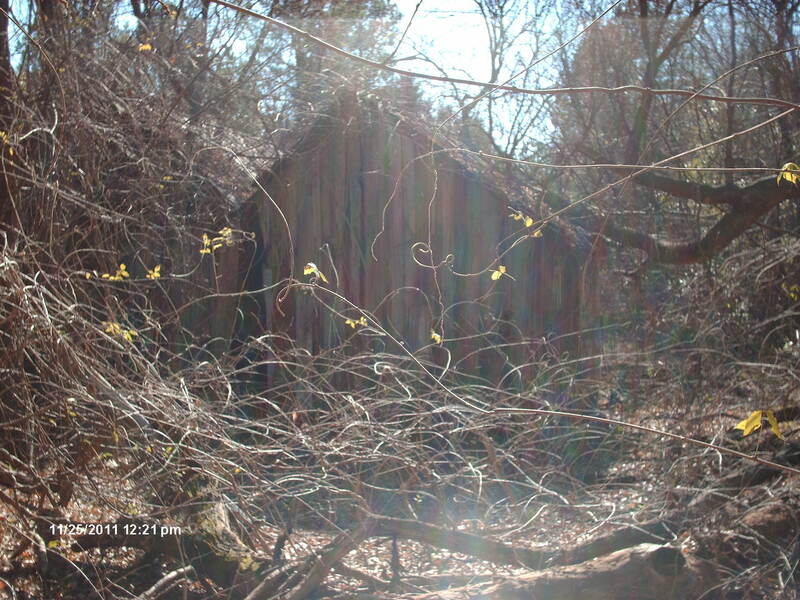 It looks like an outhouse, but someone probably lived in it a long time ago. Perhaps it was a hunting cabin. It’s surrounded by overgrown chinaberry trees (I think). Over 200 species of birds have been recorded at the SBAC, and I saw about 5 % of them in the hour I was there. I suppose, if I could have stayed all day, I could have easily doubled that number. I didn’t see any of the rare birds that make this preserve special–bald eagles, Cooper’s hawks, wood storks, Bachman’s sparrows, prairie warblers, Swainson’s warblers, and loggerhead shrikes. All of these species breed here, but some are migrants. I didn’t see the ponds where the water level is managed for the wood storks. Wood storks require shallow water that supports an abundance of small aquatic vertebrates. They nest close to shallow water, making it easy to feed their young. I did see a wood stork last spring around the corner from my house as it flew over a wooded stream. The 10 species of birds I did see were common–white breasted nuthatches, Le Conte’s sparrows, downy woodpeckers, rufous sided towhees, mourning doves, cardinals, crows, redwinged black birds, and turkey vultures. This was the first time I’d ever noticed and identified the white breasted nuthatch, though I realize now I’ve seen them many times in the past. They occur in pairs, and I did see 2 flying together. The other hiking trail is actually named the White Breasted Nuthatch Trail. On the way to this preserve I drove on bridges over Phinizy Swamp, Merry Brickyard Ponds, and the Savannah River, and I spotted 4 additional species–black vultures, common mergansers, great blue herons, and egrets. None of the birds in the SBAC cooperated with my attempts to photograph them. They kept flitting about and perching high in the trees. There’s an open pine savannah with longleaf pine and wire grass alongside the unpaved road that leads to the trails, but I didn’t stop to photograph it. I didn’t see any longleaf pine trees along the trail I hiked, though much of the forest is quite open there, and the fires they use to manage the savannah have undoubtedly spread here. 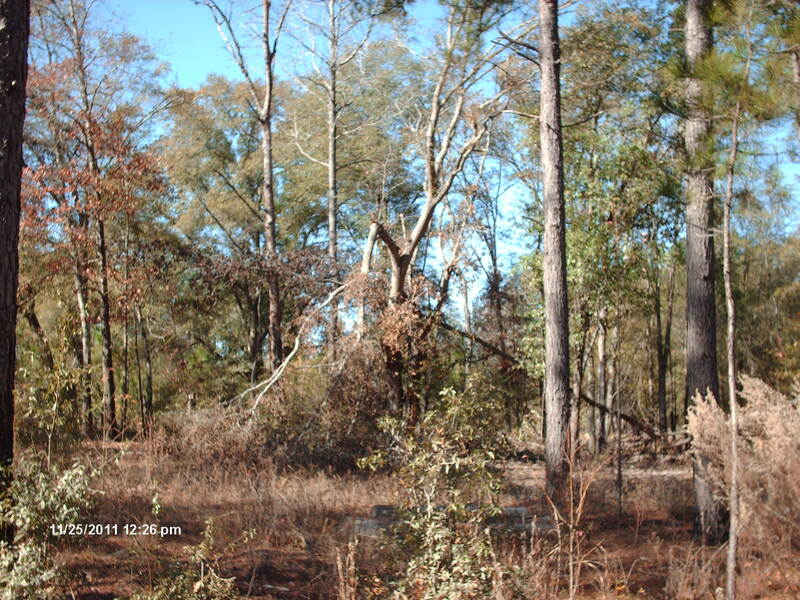 Much of the forest in the SBAC is open like this. It consists of a few species of pine and many species of oak. 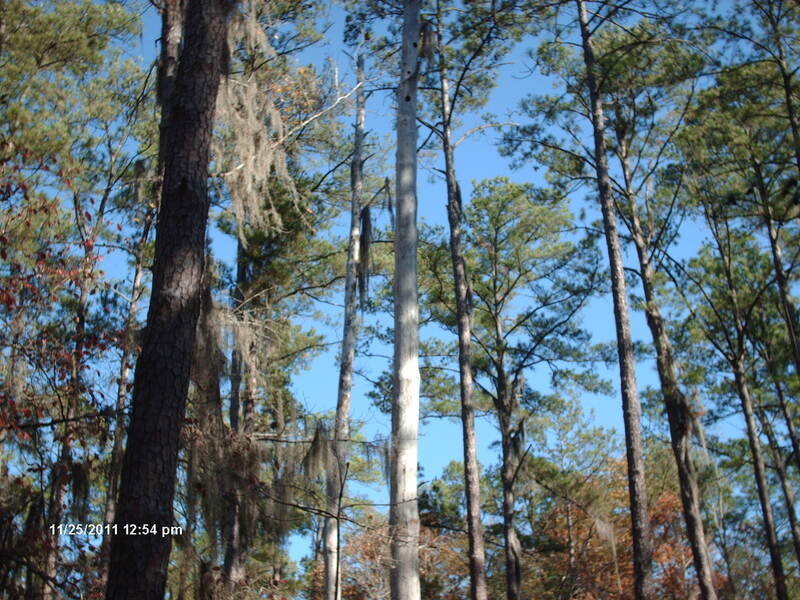 These are loblolly pine, I believe. 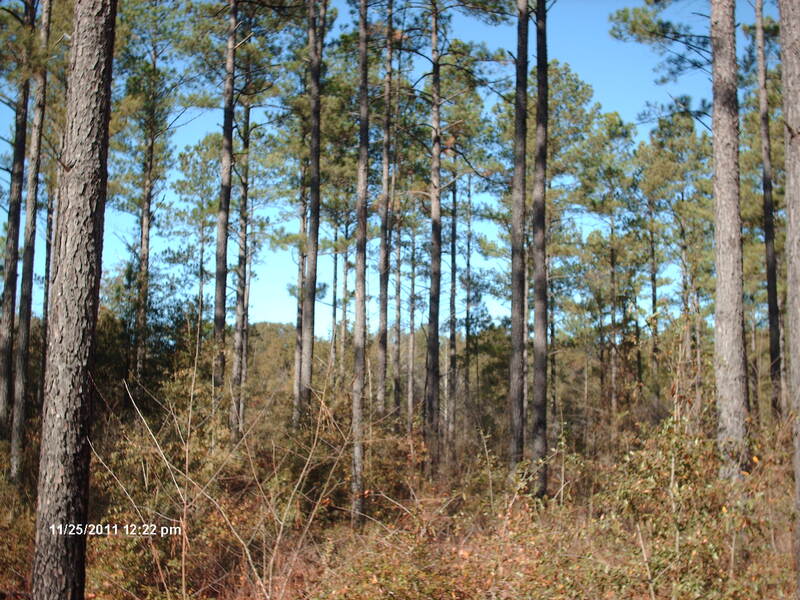 Shortleaf pine and loblolly pine hybridize and some of the trees showed characteristics of both. Many of the pine tree trunks are charred, showing evidence of fires. The fires used to manage the open pine savannah evidentally spread here. 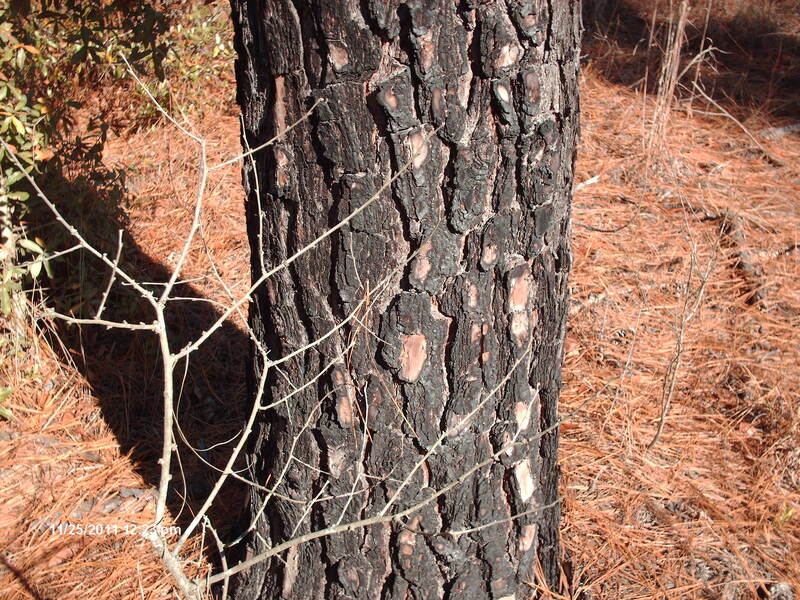 Both pines and oaks are fire resistant. Most pine and oak trees over 3 years old can survive light ground fires. Some species of oak, however, are somewhat less fire resistant. They may survive, but the fire damage makes them vulnerable to diseases which rot out the wood and create snags. Here’s an oak tree that was wrecked by a storm, probably earlier this past summer. Common trees along the Tanager Trail that I identified include loblolly pine, shortleaf pine, hybrid pines, water oak, laurel oak, Shumard’s oak, southern red oak, black or cherry bark oak (I can’t tell the difference), blackjack oak, swamp chestnut oak, post oak, overcup oak, sweetgum, hickory, beech, and tupelo. The composition suggests what botanists might refer to as a mesophitic river terrace forest because most of the species prefer moist sites. I had never noticed and identified Shumard’s oak before, though I’ve certainly seen it. Shumard’s oak can grow to 100 feet tall. It’s a valuable species utilized for reforesting bottomlands due to its fast growth rate. Swamp chestnut oak occurs here as well. It’s also known as cow oak because its acorns are palatable enough for cows to eat. Spanish moss grows on most of the hardwoods here. Is this a dried out Carolina Bay? I took this photo while standing on a boardwalk, but last summer must have been so dry the water here completely evaporated. Tupelo trees grow here. They normally grow partially submerged. I think this might be a Carolina Bay. There’s lots of snags in these woods. The tree on the right is a beech. I’m always excited to find this northern species in Georgia. I couldn’t identify the tree on the left because the leaves had all fallen off, but there were a lot of hickory leaves on the ground around the trunk. Note the woodpecker hole at the very top of the debarked tree. Did the woodpeckers debark their nesting tree? A windstorm knocked this tree precariously over the trail. Several other trees were knocked over in a neat row. Tornado or downburst? 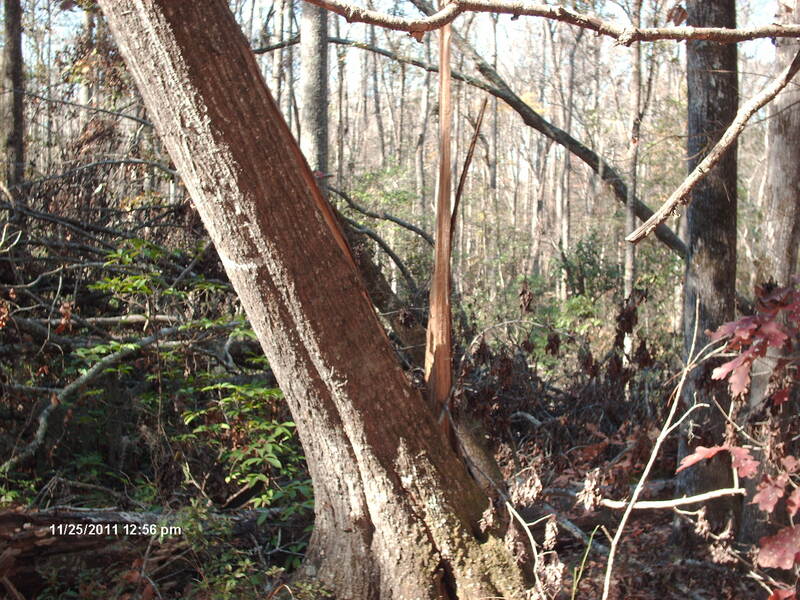 Photo of the trunk of the leaning tree in the previous photo. The base is cracked. 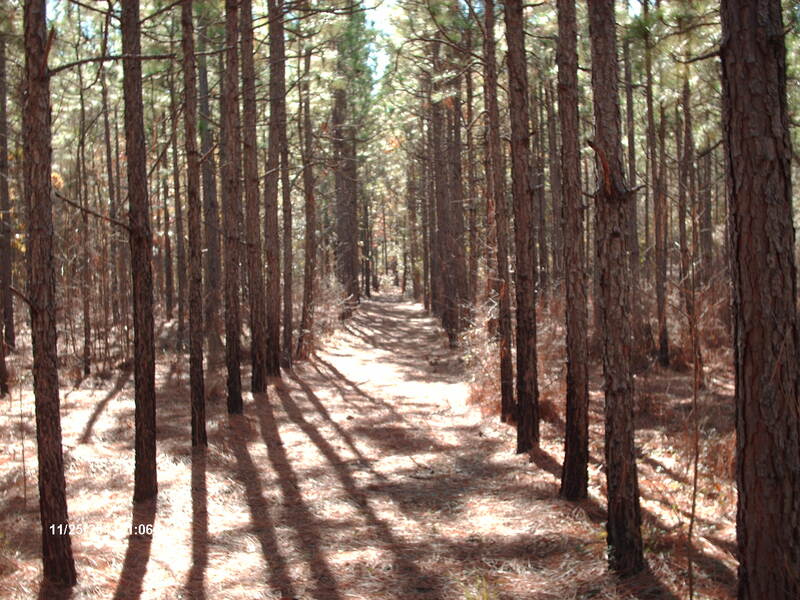 The trail goes through a planted pine plantation. I couldn’t believe the trail sign pointed this way. I thought some practical joker had twisted the sign because a trail criscrossed this one. Luckily, I did follow the sign. Trees are harvested here, but for the most part the management is beneficial for the birds. This was the dullest part of the trail, though a big flock of redwinged blackbirds flew over us here. I saw deer tracks and heard a squirrel barking–the only mammal life I detected here. 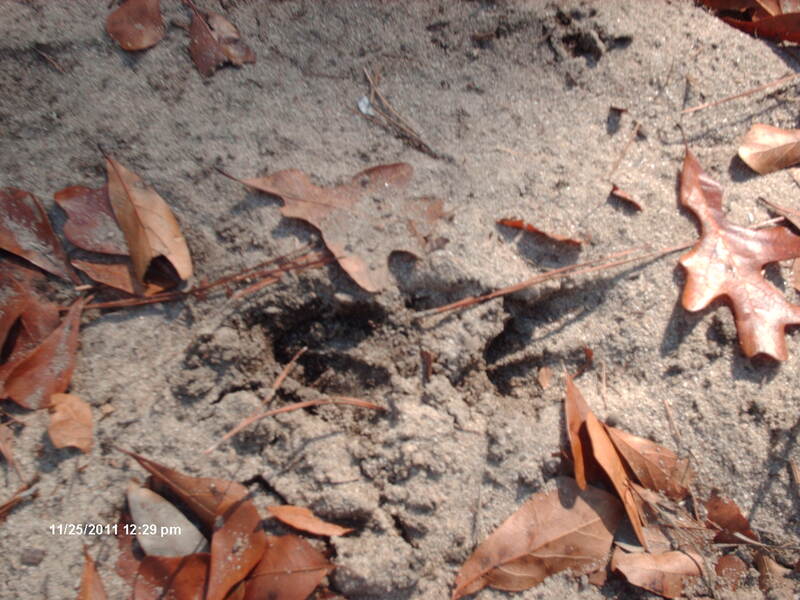 Surrounding this deer track are fallen leaves from laurel oak, water oak, and overcup oak. If I would have had more time I would have walked down the unpaved road to the river. 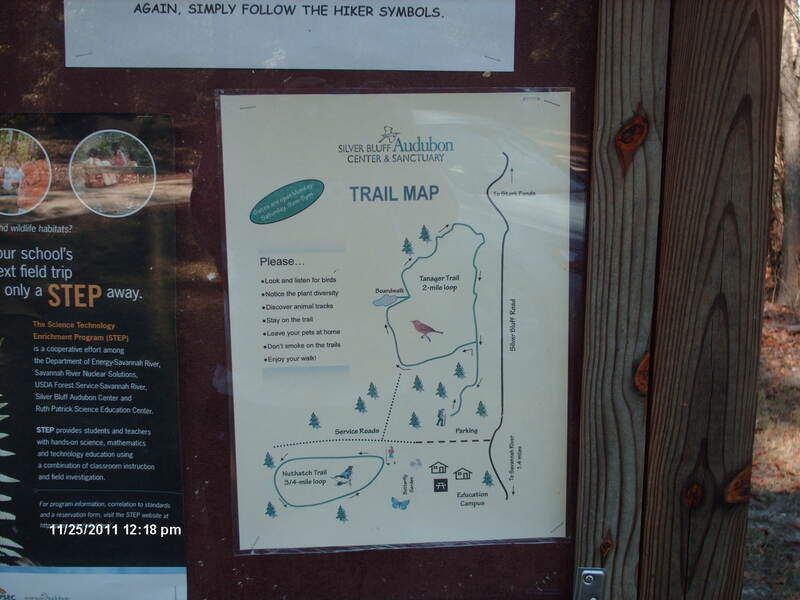 I hiker can easily get over 5 miles of enjoyable walking here on the trails and unpaved road. On the Friday after Thanksgiving there were only 2 other cars parked here, so it’s not at all crowded. I’m writing a food-oriented blog entry in honor of Thanksgiving week. If I’m going to live in my imaginary adobe brick home 36,000 years BP on a stone-wall protected piece of land 1 mile north of the Broad River and 2 miles west of the Savannah River, I’ve got to have certain favorite foods. But I don’t want to travel back and forth through the time portal to go grocery shopping. I’d suffer a letdown every time I left my pristine wilderness and returned to the decimated mess man has created. So I’d manufacture as much of my own food as possible on my Pleistocene homestead. There are numerous staples of my diet I can’t live without–cheddar cheese, chili con carne, sourdough bread, fruit, vegetables, brown gravy, soy sauce, etc. 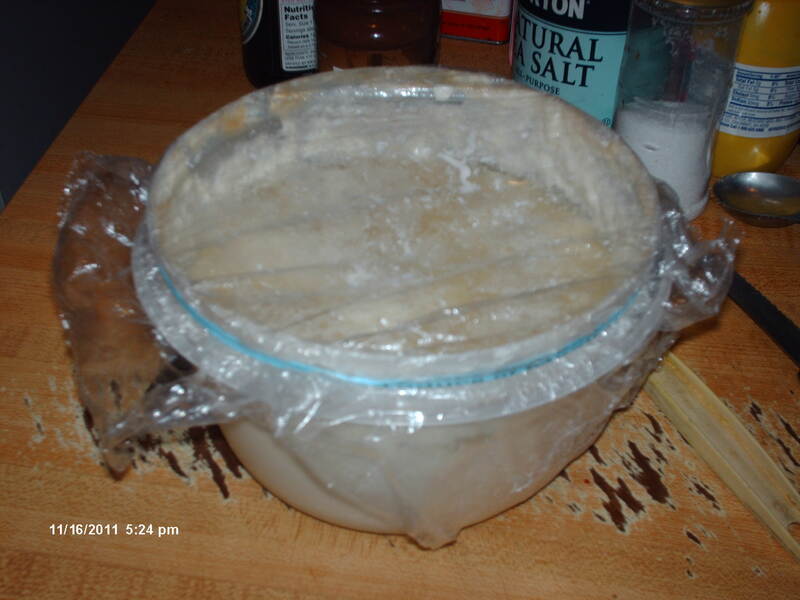 I’ve been making sourdough bread, pancakes, and biscuits from this sourdough starter since 1998. I grow my own wheat on my Pleistocene homestead. (In reality I have successfully grown wheat in my backyard garden.) The weather conditions in Georgia during the interstadial I chose should be favorable for winter and spring wheat. Setting up a stone mill for grinding grain into flour though is too complicated. An electric home mill that I plug into an outlet is sufficient for my needs. (I have electricity, thanks to solar power and a generator that runs on wood alcohol which I manufacture.) It’s necessary to grow 2 kinds of wheat–a high protein variety for bread and a lower protein type for pastry. I’ve got to have pies and cakes. A bowl of red with a side of cornbread. 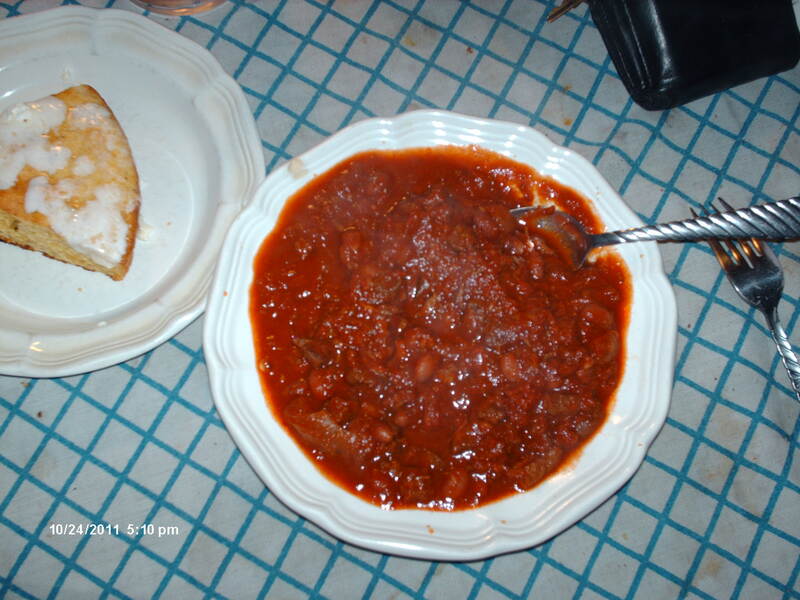 Chili con carne is my favorite dish and a useful one for converting dodgy game meats into tasty food. For this batch I diced round steak and cooked it in the crockpot. I more commonly use ground meat which shouldn’t be cooked in a crock pot because slow-cooking the meat that long will turn it mushy. I use 2 tablespoons of pure New Mexican chili powder per pound of meat. I serve it on red beans that are cooked in a different pot. I can’t live without chili. This is a quite useful dish for Pleistocene living. Most of my meat is wild game. I live in a mostly forested region interspersed with small prairies and meadows. The most common big game animals are white-tailed deer, elk, and long-nosed peccary. Less common but occasionally available are long-horned bison and horses. Depending on the age, condition, and diet, the meat from these animals varies in flavor and tenderness. By grinding the meat and seasoning it heavily with chili powder and tomatoes, I can make tougher cuts of meat taste good. George Leonard Herter in his book, How to Get out of the Rat Race and Live on $10 a Month (a volume that deserves its own blog entry), wrote that the only way he could make coot meat taste good was to turn it into chili. He stated that coot meat tastes like a mouthful of mud prepared any other way. Cajuns soak coots in milk overnight to get rid of the bad flavor. I avoid coot meat. I do raise milk cows on my Pleistocene land, but I’m reluctant to kill them for meat because they’re like pets that provide me with cheddar cheese, butter, and cream. So my chili is most often made from venison and/or peccary meat. Tomatoes, new Mexican chili peppers, red beans, onions, garlic, and cumin all grow in my garden and greenhouse. 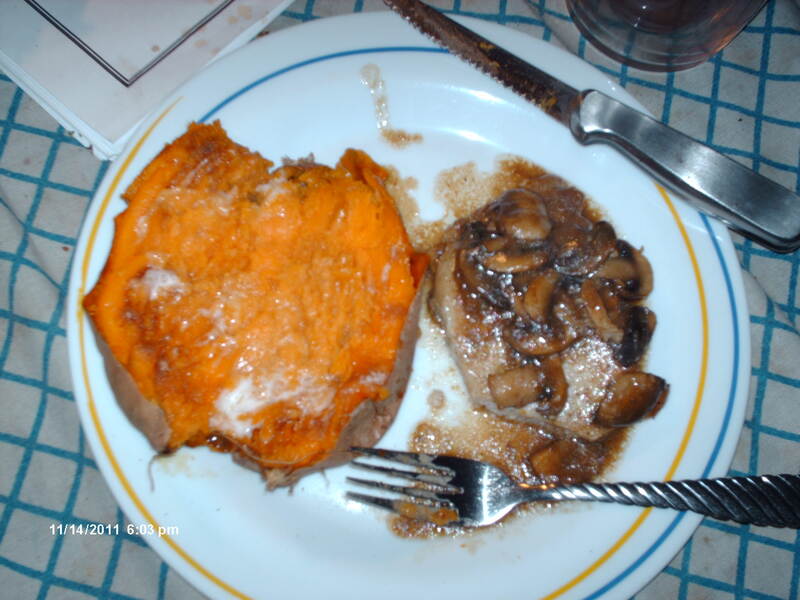 Jagerschnitzel with a side of sweet potato. I had leftover mushroom gravy from making hamburger steaks and gravy (another good dish for using wild game meat), so I added fresh mushrooms and smothered pork chops in the gravy. Sweet potatoes should be easy to grow during an interstadial. The good cuts of a peccary make excellent pork chops. I could probably eat chili everyday and never get tired of it, but I also like meats smothered in a brown mushroom or onion or mushroom/onion gravy. Lipton makes a great mushroom-onion gravy mix that I believe I can duplicate. In my Pleistocene garden I cultivate shitake mushrooms. (In reality I innoculated an oak stump with shitake mushroom spawn. I’m still waiting for the first bloom.) Mushrooms don’t grow year round, and I wouldn’t dare forage for wild mushrooms, so I dry some of the cultivated ones when they bloom. I make my imitation Lipton gravy mix with dried mushrooms, dried onions, flour, salt, and soy sauce and store it in jars. I brew my own soy sauce–another magical condiment that transforms wild game meats into civilized food. I make a fine dish by slicing tough game meats against the grain and stir frying them with vegetables. Marinating game meats with vinegar, oil, oregeno, and salt and cooking them shish ka bob style also helps to make them tender. 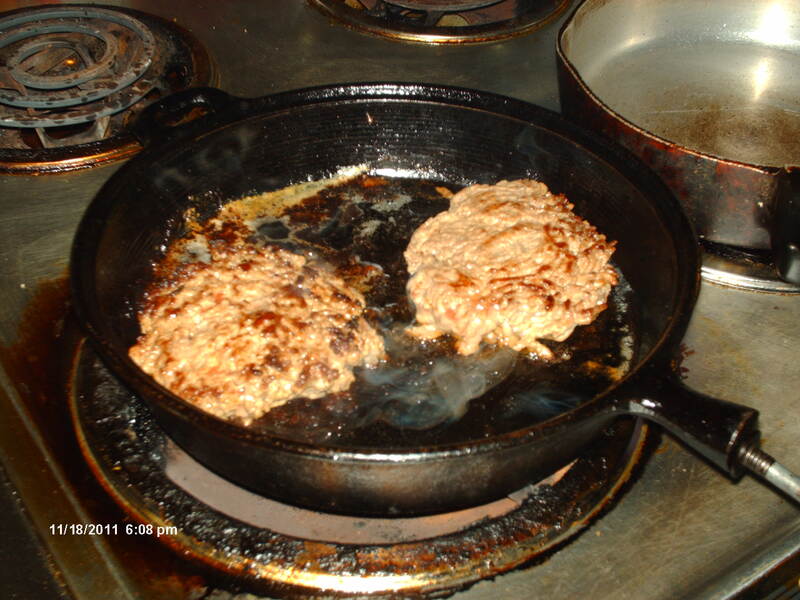 Frying hamburgers in an iron skillet. I love cooking in this vessel. The best Pleistocene hamburgers are made out of the ribeye steak meat from a long-horned bison. I more commonly have venison in my meat freezer. This requires added fat. 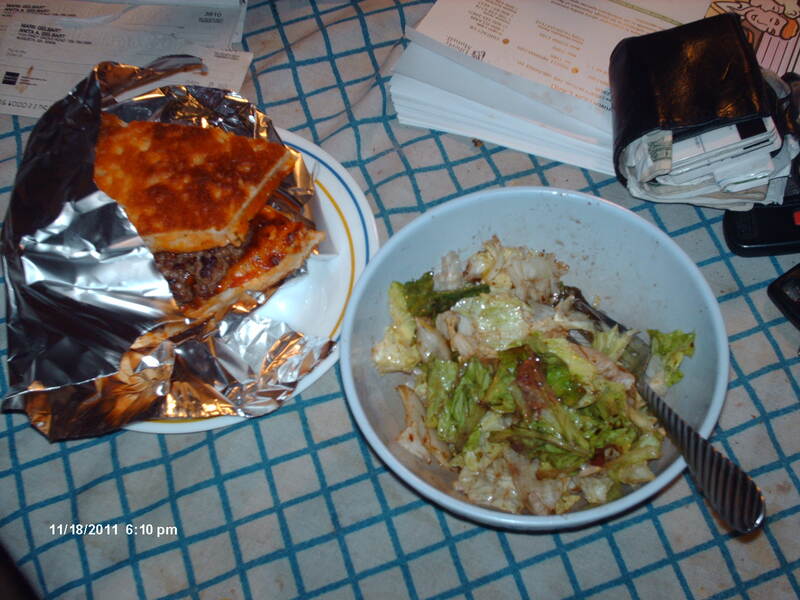 A Niles pizza burger with a salad. Niles, Ohio is the only place I’ve ever seen a real pizza burger on the menu. I lived in Niles from the age of 2 to the age of 13. It’s another one of those little Italy’s where many Italian-Americans settled. The secret to this dish, besides using real pizza instead of a hamburger bun, is to keep it in aluminum foil, like a gyro, so it doesn’t fall apart. The salad is a mix of leaf and head lettuce dressed with balsamic vinegar, olive oil, salt, and pepper. Olives are difficult to grow in Pleistocene Georgia, but walnut oil is an acceptable substitute. 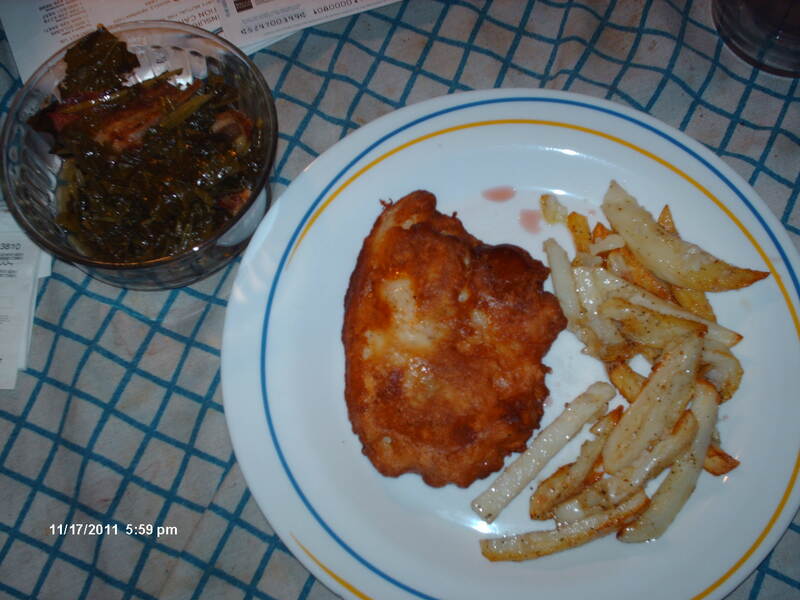 Fish and chips with a side of mustard greens. My Pleistocene home is located close to a river for the abundant food supply. Game, fish, waterfowl, turtles, crayfish, and mussels abound near the water. Potatoes are easier to grow in Pleistocene Georgia than they are today because the summers are cooler. I eat a lot of fish in the Pleistocene. I have fish traps throughout the Broad River and in the Savannah. Most of the fish are small bream, crappie, catfish, smallmouth bass, and sucker fish. I pan fry these, usually dredged with a mixture of cornmeal, flour, garlic salt, and lots of black pepper. I dip the fish in egg first so the coating sticks. (I have plenty of eggs because I raise chickens as well as geese.) Surprisingly large fish, even today, still swim in smaller streams. Fish big enough to filet often get caught in my traps. 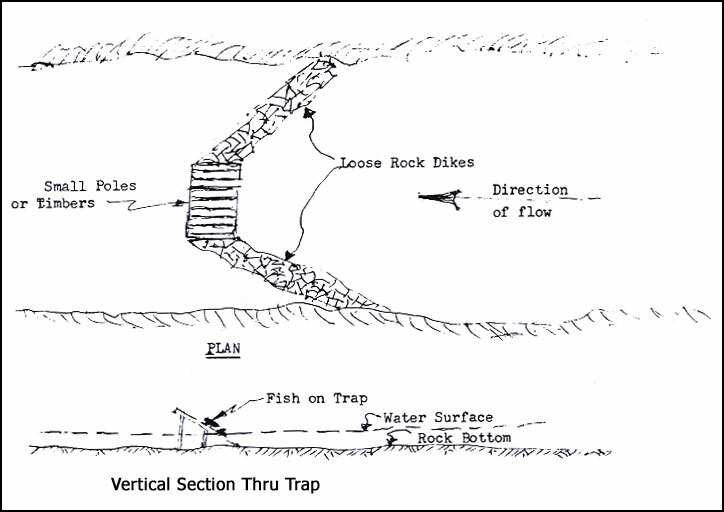 Diagram of a colonial era fish trap from google images. My Pleistocene fish trap differs slightly. Mine doesn’t stretch all the way across the river and has a net or basket at the point of the v instead of slats. I remove the net when I’m not planning on eating fish to reduce unnecessary fish kill. I sometimes use a milk or beer batter to fry these. Fish weighing over 10 pounds can be cut into steaks and grilled over a charcoal fire. Or they can be stewed. When I tire of fried fish I cook them in a white wine-cream sauce with mushrooms or sorrel. Sorrel is an easy pot herb to grow. Vegetables in the brassica family are also easy to grow. Brassica pollen even shows up in a couple of palynological studies of Pleistocene age sediment, proving that some type of wild mustard grew in Georgia then. In my real life gardening experience I’ve successfully grown mustard, bok choy, napa cabbage, turnips, broccoli, cauliflower, green cabbage, and red cabbage. All grow in my Pleistocene garden. They thrive in the long cool season. I’ve had mixed success with lettuce. Some times I can’t get the lettuce to grow big enough to use. The best lettuce I ever grew was a variety known as Rouge d’River–a red leaf type. Spicy meatball and sausage jambalaya. 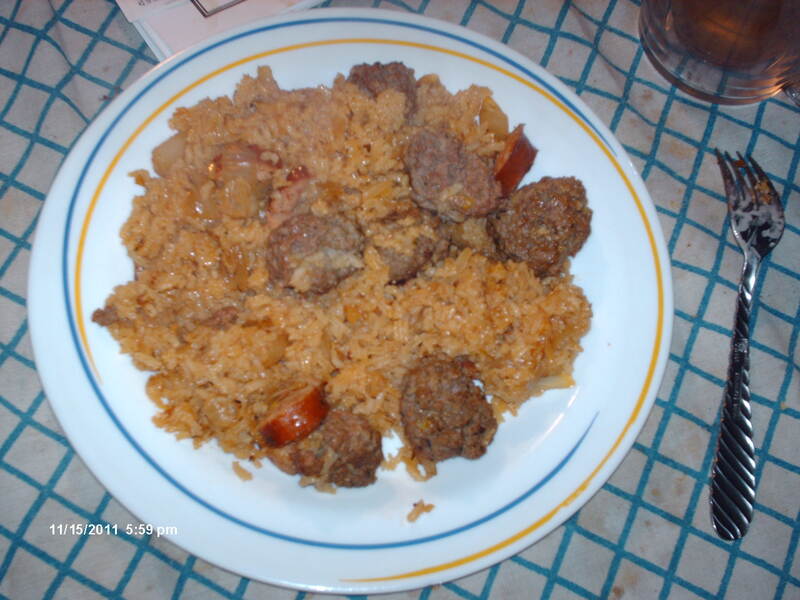 I make many different versions of this famous dish–chicken jambalaya, chicken and sausage jambalaya, double sausage jambalaya, shrimp and sausage jambalaya, turkey and ham and mushroom jambalaya, etc. I grow rice in my Pleistocene garden because I can’t live without jambalaya or dirty rice. Brown rice is a common side dish, but for jambalaya I remove the rice bran and feed it to the chickens. White rice makes a better jambalaya. I use sodium nitrates to turn the sausage red. Curing meats is another way to make game meats quite palatable. Much of my venison is corned. 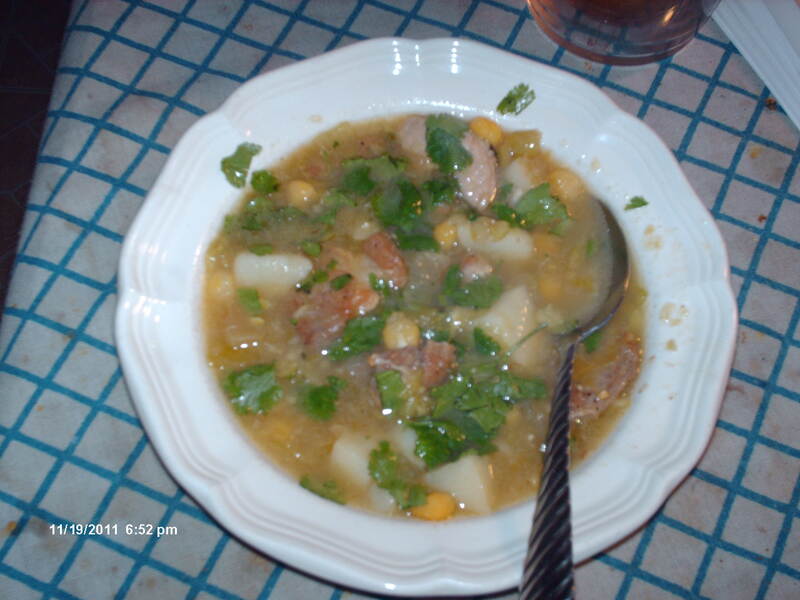 Green posole. This is the first time I ever made this dish. Corn grows in my garden. It provides a vegetable and a starch and animal feed. I manufacture corn oil and corn syrup as well. In the pioneer days the dried cobs were used as toilet paper. In my Pleistocene world I manufacture more modern toilet paper. There are just some improvements I can’t live without. 28 million years ago, South America was an island continent much like Australia. Marsupial lions stalked the land as a top predator, but big birds evolved that rivaled and probably surpassed them in ferocity. The phorashacids grew to over 6 feet tall and weighed over 300 pounds. They sported large hatchet like bills and long claws which they respectively used to bludgeon and tear apart small to medium-sized mammals, reptiles, and other birds. 5 million years ago, the continents of North and South America drifted close together, but even before the landbridge joined them, a species of phorashacid, known as Titanis walleri, island-hopped north and colonized the southern half of the continent. Two different illustrations of the terror bird. The top picture is from google images. The bottom is from the June 1997 issue of Discover magazine by Steven Kirk. Note the stiff T-rex-like arms. Scientists aren’t sure, if their arms were actually like this, because no fossil arm bones have ever been found. They assume this based on shoulder bone. Terror birds were a kind of evolutionary throwback to their velociraptor ancestors, but they differed in some notable ways. They had no teeth and they didn’t have a long tail. 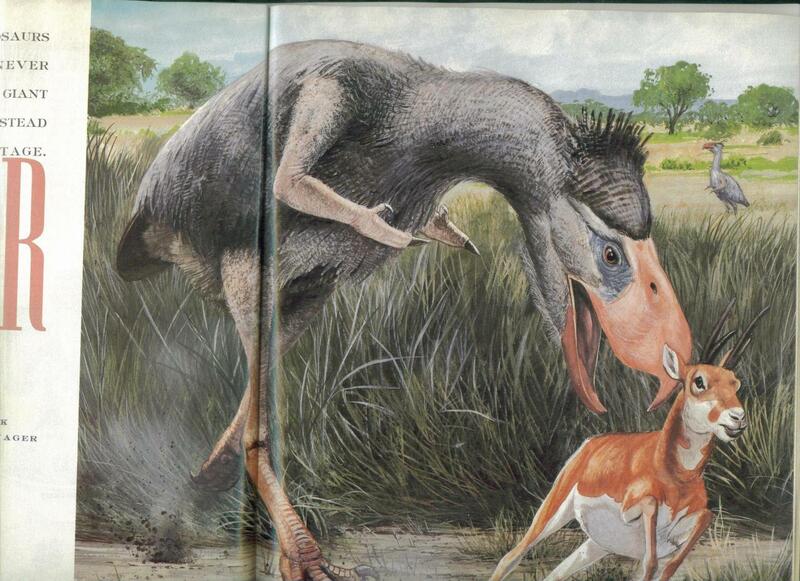 Terror birds likely found abundant food in North America such as small pronghorns, juvenile horses, deer fawns, rabbits, rodents, reptiles, as well as some carrion and plant foods. They stalked their prey, perhaps blending in color with thickets where they hid and waited for unsuspecting animals to wander. Then, with a burst of speed (maybe up to 40 mph) they’d run at the victim and stike them on the back with their hatchet-like bill, paralyzing the prey. Using dinosaur-like arms, they held the struggling prey down and tore chunks of flesh from the suffering animal. They probably picked up and dashed smaller prey on the ground before swallowing them whole, not unlike a method used by their closest living relative–the seriamas. Not a bill from Sesame Street’s friendly big bird. This is a fossil replica of a terror bird skull. According to wikipedia, a complete skull has never been found. Scientists were surprised to find Titanis walleri fossils in Florida. For birds Titanis has an unusual bone structure. Most bird bones are hollow, making them light and conducive to flight. But terror birds couldn’t fly. Its bones were thick and heavy, like a large mammal’s. Many of the first bones discovered were labled as horse bones, stuck in drawers in museum basements, and forgotten. At first scientists in Florida didn’t realized they’d excavated locally what was formerly thought to be a family of birds restricted to South America. Pierce Brodnorb formally named Titanis walleri a new species in 1963. Most terror bird fossils were excavated from the Santa Fe River in Florida, but one specimen was discovered in Texas. (The first to find fossil material of the bird in Florida was Benjamin Waller, a scuba diver.) In both fossil localities Pleistocene-age fossils are mixed with Pliocene-aged fossils because rivers are eroding through two different aged deposits. So for awhile, scientists were uncertain how recently the terror bird lived. Eventually, scientists discerned different chemical signatures from the fossil bones, using an analysis of the ratios of rare earth elements which change over time. (See my blog entry–“The Fossil Rich Region of Tunica Hills, Louisiana,” for a more detailed explanation of how rare earth elements are used to bracket the age of fossils. https://markgelbart.wordpress.com/2011/08/28/the-fossil-rich-region-of-tunica-hills-louisiana/) None of the terror bird fossils were younger than 2 million years, suggesting it became extinct early in the Pleistocene. I wonder why such an awesome predator became extinct. I doubt colder climate was the cause of extinction–there were mini-Ice Ages during the Pliocene. Giant tortoises survived the harsher Pleistocene Ice Ages, and if they survived these, the terror bird should have been able to as well. The floral composition of the environment probably didn’t change significantly between the late Pliocene and early Pleistocene. I suspect it was a new cavalcade of fauna that doomed the terror birds. Black bears (Ursus americanus) crossed the Bering landbridge about this time. Pleistocene black bears grew as big as grizzlies and were probably more ferocious than today’s bruins. Maybe they were able to drive terror birds off their nests. Maybe wolves and big cats evolved to become more adept at hunting the chicks. And maybe prey such as rabbits and small ungulates evolved to run in circles and avoid capture. Terror birds could run fast in straight lines but are thought not to have been efficient at changing directions while pursuing prey. This is the terror bird’s closest living relative. A red-legged seriama is bashing a snake against a rock. They’re an inhabitant of South American grasslands. They’re much smaller than the phorashacids, growing to only 31 inches long. A nature documentary showing terror bird hunting behavior can never be made. However, their closest living relatives, seriamas (Cariama cristata and Chunga burmeisteri), still inhabit the grasslands of South America where they prey on insects, snakes, lizards, small mammals, and other birds. They kill their prey by slamming them against rocks as depicted in the photo above and the link to the youtube video below. The Flock is a pretty good sci-fi thriller about terror birds. The book may be made into a movie. The cover of my copy of the book has an alternative illustration. The Pleistocene Bahamas epitomized the romantic image of deserted islands. Lowered sea levels in response to glacier expansion over Canada (known as a eustatic fluctuation) caused the land area of the islands to expand to more than 10 times their present size. This consolidated the present day 29 islands and 661 sand spits into 5 major islands, plus 1 major island (the Cay Sal Bank), now completely inundated, rose above sea level. Map of the Bahamas. The light purple represents the area that rose above sea level during the Last Glacial Maximum. 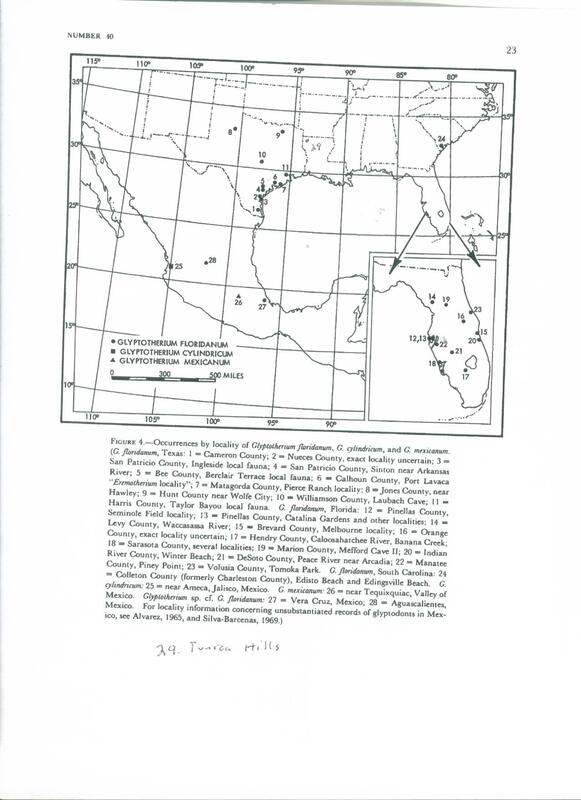 Despite being surrounded by ocean, the climate in the Bahamas during the LGM (~28,000-~15,000) was arid. Temperatures were on average about 8-10 degrees F cooler than those of today but still never subfreezing. 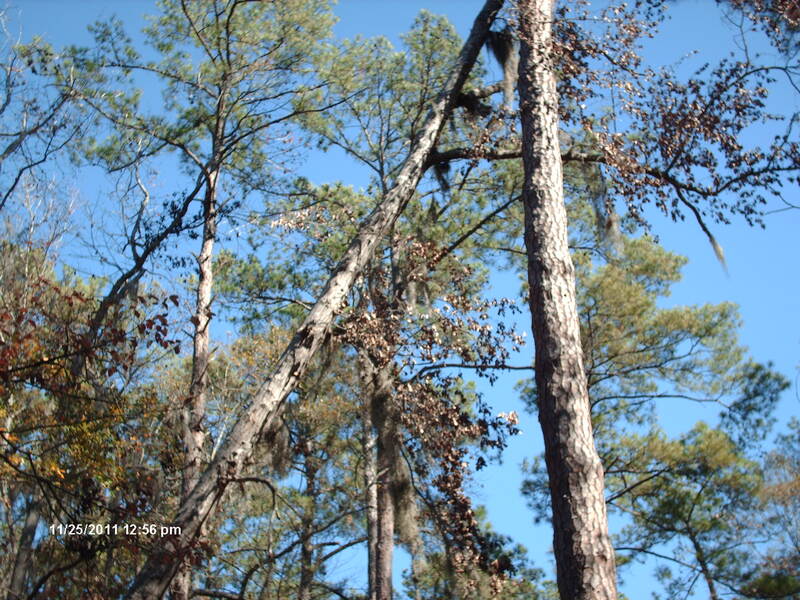 The dry climate fostered an environment consisting of extensive grasslands dotted with occasional scrub oak thickets or hardwood hammocks growing near scarce freshwater springs. The island hosted no large mammal species giving them a deserted feel that many a writer imagines when casting a fictional ship-wrecked crew on islands. Other than bats, the only mammal known to have lived on the Pleistocene Bahamas was the hutia (Geocapromys ingrahami). Hutias were the only mammal besides bats that are known to have lived on the Pleistocene Bahamas. They’re large rodents weighing up to 15 pounds. Mammal life on Pleistocene Cuba just to the south of the Bahamas was more diverse–dwarf ground sloths and many insectivores and rodents lived there–but none ever managed to colonize the Bahamas. The dearth of mammals meant birds dominated the environment. Extinct giant barn owls were a top predator on the Pleistocene Bahamas. The most spectacular predator on the Pleistocene Bahamas was the extinct giant barn owl (Tytos pollen) which was 3 times the size of a modern barn owl (Tytos alba). Today, barn owls are rare visitors to the Bahamas, but evidentally they were as common as their extinct larger cousins here during the Pleistocene. Instead of barns they must have roosted in the abundant caves on the islands because there weren’t many hollow trees either. Burrowing owls were also common on the Bahamas. A relic population of burrowing owls still lives on one corner of a Bahamian island today. The extinct 3 foot tall burrowing owl that dominated Pleistocene Cuba never made it to the Bahamas. Another interesting predatory bird on the island was an extinct giant hawk (Titanohierex gloverallani) that was larger than most species of eagle. It formerly ranged throughout the Caribbean during the Pleistocene. Large extinct subspecies of sharp-shinned hawks and red-shouldered hawks were common on the islands then but don’t live there now. Scientists assume grasslands covered most of the Bahamas during the Ice Age based on the kinds of birds found in the fossil record. Almost all are species that require an open landscape–burrowing owls, eastern meadowlarks, thick-knees (long-legged plovers), Key West quail-doves, Cuban crows, nighthawks, and caracaras. The presence of some species suggests some scrub oak thickets existed. There were Cuban parrotts, white crowned pigeons, red-necked pigeons, scaled pigeons, Bahamian mockingbirds, great lizard cuckoos, red-bellied woodpeckers, red-legged thrushes, tanagers, hummingbirds, and others. Of course, sea birds must have been abundant. One megaherbivore did trudge across the deserted landscape. An undetermined species of giant tortoise (Hesperotestudo sp.) thrived on the dry vegetation. Rock iguanas shared the dry land plant foods with their distant reptilian cousins. Smaller lizards–several kinds of anoles and at least 1 species of gecko–abounded on the deserted paradise as well. Dwarf boa constrictors terrorized the hutias and along with raptors and owls kept their populations in check. Crocodiles patrolled the marshes. Scientists aren’t sure if the species was the same as the extant freshwater (Crocodylus rhombifer) or saltwater (Crododylus acuta) crocodiles still found in Cuba or whether it was a unique extinct species because the fossil material is too meager. Perhaps both lived on the islands then. There are no crocodiles on the Bahamas today because the existing mangrove swamps are too saline for juvenile saltwater crocodiles which prefer brackish swamps. If we could take a time trip back to the Pleistocene Bahamas, crocodiles would be the only dangerous animal to be wary of. 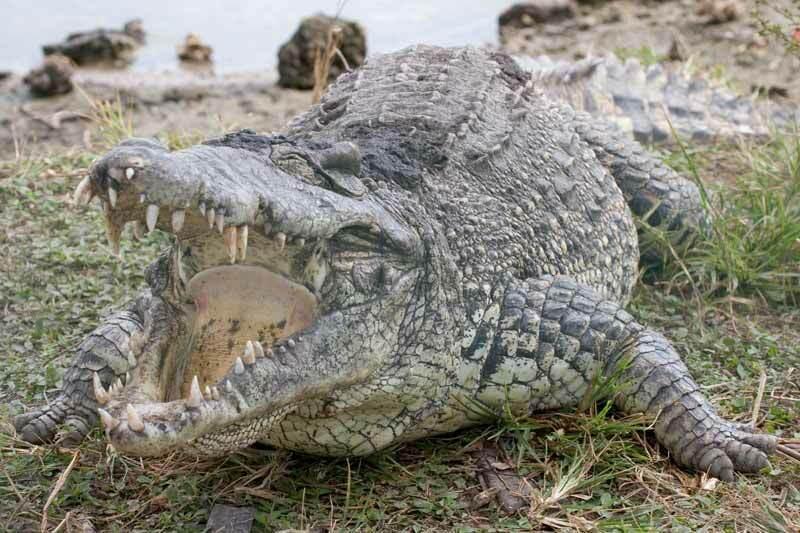 This is a Cuban freshwater crocodile. From google images. The extinction of most of these species was caused by environmental change. Caribbean pine trees spread over the islands beginning about 13,000 years ago. Rising sea levels inundated much of the habitat, and a humid climate allowed pine forests to replace the grassland, eliminating any suitable remaining habitat for many of these species. Fossil sites on the Bahamas are known collectively as banana holes, and one site is known specifically as the Banana Hole Fossil Site. Originally, they were caves or sinkholes formed from coral reefs that became covered in sediment. The fossil coral reefs became limestone, and rainwater dissolved the stone, creating caverns underground. Some remain as caves, others collapse and form sinkholes. Large animals such as tortoises and iguanas fall into these caverns and die, but the majority of fossils here are deposited by roosting predatory birds. Over time fertile soil fills the caverns. Farmers mine this rich soil and many fossils are actually found in farmer’s fields. Thanks to the productive soil, banana farmers often choose these sites to plant their trees, hence the name–banana hole fossil sites. Photo from google images of Caribbean bananas. I love these little bananas which are far tastier than the big ones most often found in American supermarkets. Bill Clinton took a $600,000 bribe from Chiquita banana and in exchange agreed to help crush the Caribbean banana industry with international trade agreements that punish small farmers. Bill Clinton is a crooked shmuck. During the Last Glacial Maximum when much of the world’s water became locked in glacial ice sheets, the climate in southeastern North America was much drier. Small rivers dried up and larger rivers shrank in size and became braided in pattern so that they were like long chains of disconnected channels. The exposed river sands blew into eolian dunes like those from this picture of a modern Mojave desert dune. Ironically, during these cold stadials, as the climate became dry in southeastern North America, precipitation increased in the southwest, so that it was quite lush there. Dry climate phases have periodically struck southeastern North America many times over the past 5 million years. Scientists know little about the paleoecological details of most of these phases because there’s not much available data. But thanks to one study, they do have a relatively clear understanding of the ecological composition of south central Georgia from 30,000 years BP-25,000 years BP. Scientists took a 17 foot core of sediment from a peat deposit next to Sandy Run Creek on Warner Robins Air Force Base which is located near Macon, Georgia. They radio-carbon dated the sample and counted the pollen grains to determine what the environment was like during this time period. This was a time of glacial expansion and as much of the earth’s water became locked in ice, less moisture in the atmosphere was available as precipitation. Southeastern North America experienced extended droughts causing the water table to drop. Water flow on major rivers was greatly reduced creating braided river patterns and this turned the rivers into chains of disconnected channels interspersed with islands and sandbars. In some cases small rivers completely dried up, exposing great quantities of river borne sand. Atmospheric conditions caused by the glacier to the north spawned frequent westerly and southwesterly winds that blew this river borne sand across the landscape forming huge eolian sand dunes. Today, vegetation has taken root and holds down the eolian sand dunes that formerly rolled across Georgia’s landscape during cold arid stadials. 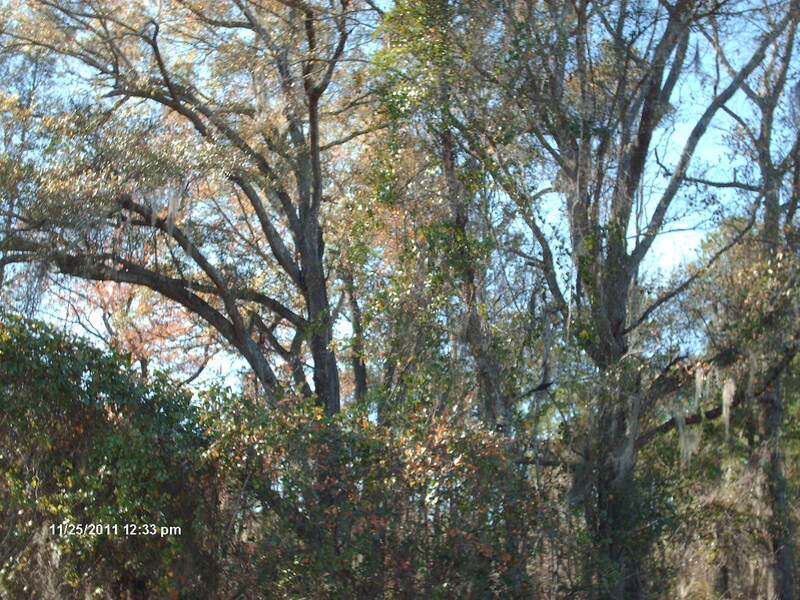 Now, scrub turkey oak and longleaf pine covers the Ohoopee sand dune in Georgia. The sandy soil is of poor quality and not enough litter accumulates to foster fire, allowing scrub oak to become more common than pine. Photo is from google images. 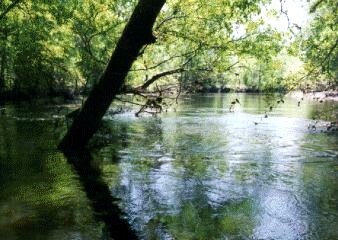 Photo from google images of the Ohoopee River. This and other small rivers dried out during cold dry climate phases. Instead, small pools of water appeared sporadically in the river bed. The scene would have resembled modern African water holes. The evidence from the pollen composition of the Sandy Run Creek peat core indicates a much different landscape than occurs anywhere in Georgia today. While eolian sand dunes rolled to the east of reduced or even completely dried rivers, lightly wooded grasslands predominated over much of the environment. Here and there were groves of pine with some spruce. (The species of pine isn’t known, but my educated guess is they were a mixture of northern and southern species, probably shortleaf and white. The species of spruce was likely the extinct Critchfield’s.) Oaks and other deciduous trees clung to the vicinity of shrinking water holes found along the braided rivers. Pine composed 39%-75% of the pollen, while oak only made up 12%. Grass and coniferous trees require less water than hardwoods, and are less prone to physical damage from frequent wind, explaining why they were more abundant. Scientists found no charcoal in the part of the core dating from 30,000 BP-25,500 BP–evidence wild fires were a rarity. This suggests a thinly vegetated environment where combustible material such as dead wood didn’t accumulate. Moreover, lightning storms that ignite fires were uncommon. Charcoal is present in the part of the core dating from 25,500 BP- 25,000 BP, perhaps indicating a weak interstadial with more frequent electrical storms. Grass-eaters such as mammoths, horses, and bison likely predominated in this kind of environment along with the occasional Harlan’s ground sloth which preferred more open environments than its cousin–Jefferson’s ground sloth. Badgers, thirteen-lined ground squirrels, and perhaps jackrabbits colonized the region then. Animals that prefered more forested environments were restricted to riverine woods. Game accumulated around shrinking water holes and this probably contributed to erosion of riverbanks which in turn added sediment to the formation of eolian dunes. These congregations of herbivores attracted predators such as dire wolves, jaguars, and saber-tooths. 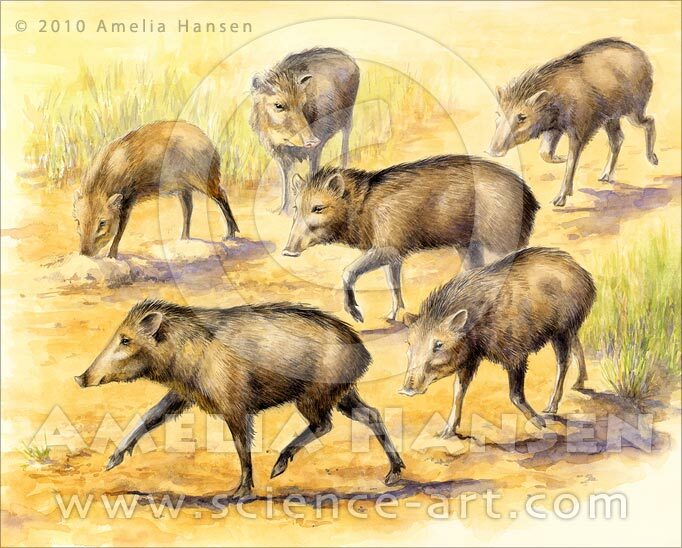 You can buy this illustration of flat-headed peccaries (Platygonus compressus) from the website engraved on the image. This kind 0f peccary was probably pretty common during dry climate phases in the south. They ate tough spiny vegetation such as cactuses. They lived in large herds that were probably aggressively defensive, much like modern white-lipped peccaries. Photo of a jaguar in Arizona. Jaguars inhabit many different types of environments such as deserts and rain forests. They were adaptable enough to probably have been the most common large cat in southeastern North America during stadials and interstadials. Photo of a hog-nosed skunk. Today, this species lives in Mexico and the southwestern United States. Fossils of hog-nosed skunks have been found in Georgia and Florida. They must have colonized the region during dry climatic phases. 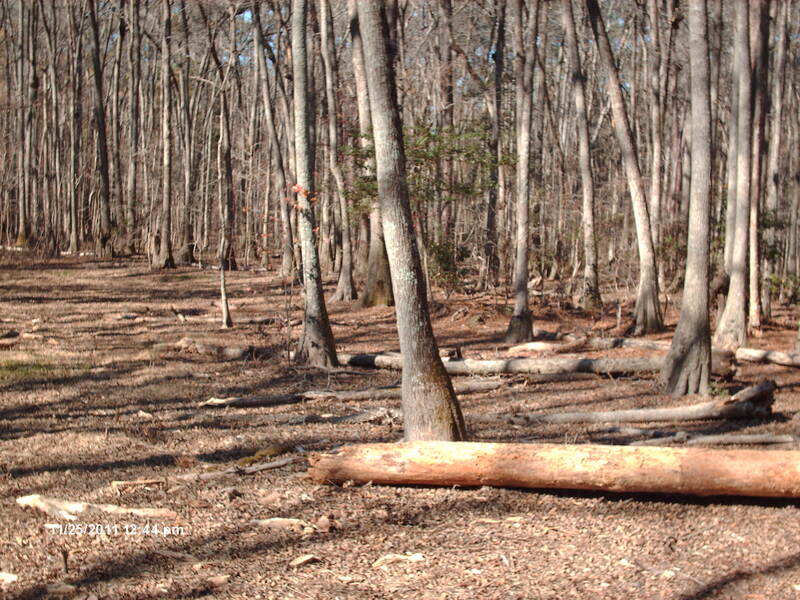 There’s no sediment in the Sandy Run Creek peat core dating from 25,000 BP-13,000 BP. Scientists call this an erosional unconformity. They believe the creek changed coarse or flooded and washed away all the sediment accumulated during this time period. This is consistent with what we know of the environmental changes that occurred during this time period. About 16,000 years BP the Boling-Alerod interstadial began. The Laurentide Glacier rapidly commenced melting, putting more moisture in the atmosphere and precipitation increased. The water table rose and so did river flow. Rivers no longer consisted of braided patterns, but instead meandered to an even greater degree than they do today, forming scroll-like sandbars. 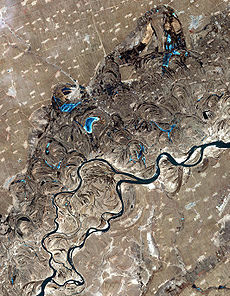 Satellite view of a meandering river with scroll bars. During the Boling-Alerod Interstadial beginning about 16,000 years ago, precipitation increased, causing rivers to meander even more than they do today. This new river pattern formed frequent scroll bars. a kind of sand bar created when the meander of a river continously shifts and leaves ridges parallel to the meander. Though sand dunes no longer rolled across the landscape during the interstadial, there’s evidence of considerable sandbar formation. Scroll bar formation suggests a dry season/wet season climate. Autumn and early winter were mostly dry and river levels fell, exposing sand bars. But existing atmospheric factors caused heavy precipitation in late winter, spring, and early summer. Warm tropical fronts collided with cold parabolic winds originating from the still extant glacier. This spawned great snow, ice, and rain storms that caused massive floods. Rivers shifted. Occasional tropical storms compounded this trend. The pollen record of the Sandy Run Creek peat core, which picks up again about 13,000 BP, demonstrates a much different environment from that of 25,000 BP. From 13,000 BP-11,000 BP there was a sudden cooling trend known as the Younger Dryas. The paleobotanical evidence, however, still shows the influence of the previous interstadial warming trend. 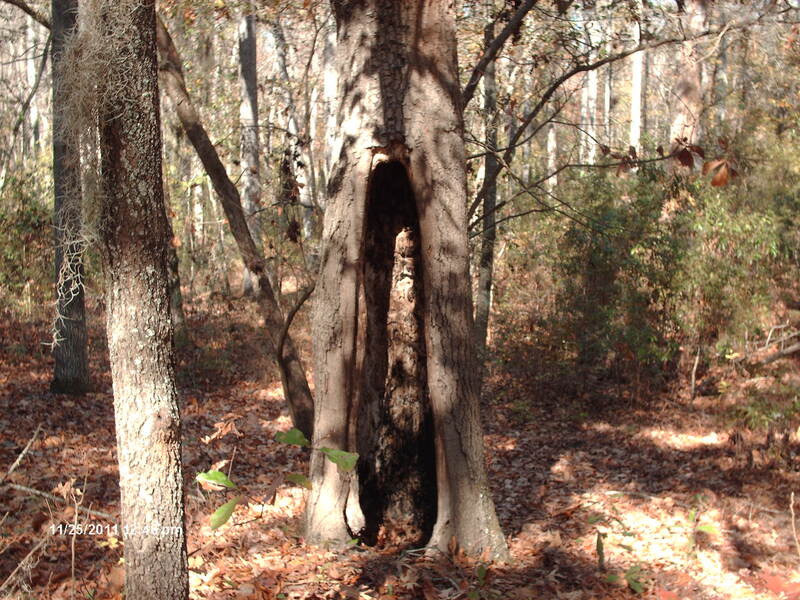 A cool, moist, open oak woodland prevailed in south central Georgia during this time period. 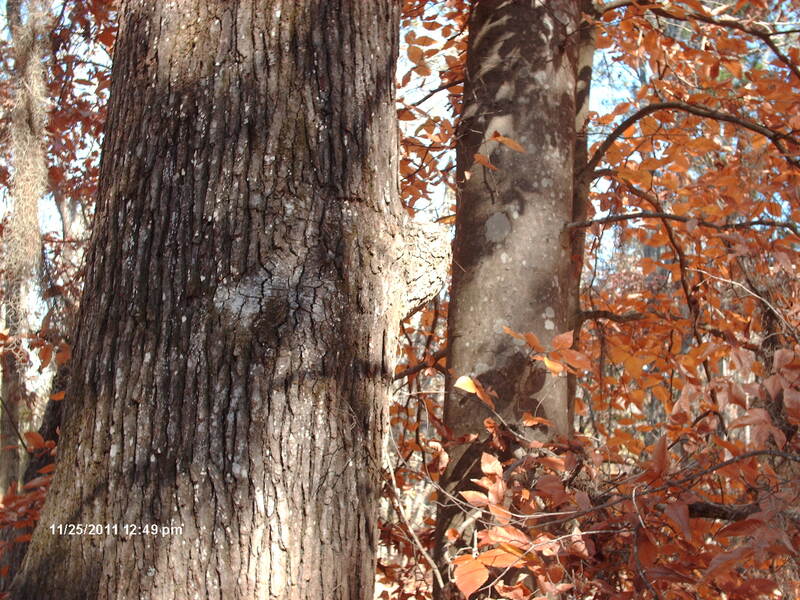 Oak pollen doubled from 12% to 24% while pine pollen declined to just 7%. Critchfield’s spruce and fir were still present but so were hickory and beech–a clue that temperatures were moderate but remained cooler than those of today. An increase in charcoal is evidence that vegetation was thicker than it had been in the previous time period because now there was more forest litter available as tinder for fires. And the frequency of lightning storms, which ignites fires, increased. A northern species of alder, a type of shrubby birch that no longer occurs in Georgia, commonly grew in abandoned, dry, river meanders. Grasslands still existed to a greater extent than occurs naturally today but had declined in abundance compared with 25,000 years BP. Scientists use an interesting method to help determine changes in the density of vegetation over time. They add exotic pollen to cores of sediment. In this study of the Sandy Run Creek sediment core, they added a known quantity of eucalyptus–a species which didn’t live in North America during the Pleistocene. The ratio of eucalyptus to native pollen was high during the time period of 30,000 years BP-25,000 years BP–evidence vegetation density was low. Conversely, the ratio of introduced eucalyptus pollen was low during the time period between 13,000 years BP-11,000 years BP–evidence the vegetation density was higher. The change to a more moist wooded environment favored higher populations of mastodon, deer, long-nosed peccary, bears, beavers, tree squirrels, and cottontails. Photo of a Glyptodont skull with puncture holes made by the bite of a species of fanged cat, probably a western dirktooth. This fossil is at least 1.8 million years old. The Frick Collection in the American Museum of Natural History includes a remarkable specimen catalogued as F: AM 95737. One lucky fossil hunter found this skull of a juvenile glyptodont at the 111 Ranch in Graham County, Arizona. It’s a complete skull minus a few missing lower molars. This alone makes it unusual because most excavated fossils consist of disarticulated pieces. Holes in the skull inflicted by a fanged cat make this discovery all the more fascinating. This species of glyptodont is Glyptotherium texanus, a species which dates to the Blancan Land Mammal Age, a stage that ended early in the Pleistocene 1.8 million years ago. G. texanus is believed to be ancestral to G. floridanus, the species of glyptodont that lived in southeastern North America from 300,000-11,000 years BP. The species of cat that apparently killed this baby glyptodont can’t be determined with certainty, but it was probably a western dirktooth (Megantereon hesperus), a species ancestral to the Rancholabrean era species’ Smilodon fatalis and Dinobastis serum (the scimitar-toothed cat). The dirktooth evidentally attacked this young glyptodont from the front. Scientists consider this unusual because most cats assault their prey from the rear. In addition to their armored skull adult glyptodonts had a tough cephalic shield protecting their skull, but the cephalic shield was undeveloped in the young, explaining how a western dirktooth’s bite was able to penetrate through to the brain. The glyptodont skull was found associated with other fossils, including those of one and three-toed horses (Equus and Nannihippus), hares, and more tellingly capybaras and giant tortoises. The latter two species indicate a subtropical to tropical climate. Climatic patterns were quite different during the Pliocene and throughout much of the Pleistocene. Southwestern North American enjoyed a wet lush environment then, unlike the desert of today. Lots of lakes and marshes dotted the landscape. Illustration of a glyptodont. More than one description in the literature compares the size and shape of this beast to a Volkswagon. They weighed up to a ton. Note the stiff turtle-like shell and wide spreading feet. The glyptodont was a bizarre mammal resembling a turtle. It’s closest living relatives are the other edentates–armadilloes, anteaters, and sloths. Armadilloes also have armor, but theirs is flexible. Glyptodont armor was stiff and turtle-like. Scientists don’t know if it could withdraw its head inside when threatened. They were adapted for living in flat, marshy terrain. Their feet spread wide enabling them to stand on and traverse muddy marshy ground, but they were unable to climb up hills. The range map below suggests they inhabited coastal lowlands and flat river valleys. They expanded their range during warm interglacials and interstadials, and conversely their range contracted during cold arid stadials. They inhabited dense vegetation in marshes and swamps which predators avoided because of difficulty in gaining traction and perhaps mosquitoes. Mosquitoes may not have been able to penetrate glyptodont armor. Map of fossil sites where remains of G. floridanus have been found. This is from the below referenced paper. This map was drawn in 1981 before a glyptodont fossil was discovered in Louisiana. I added that locality to the map. Note the latitude of some of the inland sites. This suggests that during warm interglacials glyptodonts colonized wetlands in upper river valleys. They may have periodically occurred as far north as what’s now Augusta. Glyptodont fossils are often found associated with fossils of capybaras and giant tortoises, indicating they occupied the same kinds of habitat. Glyptodont teeth even resemble capybara teeth, though the former lack enamel. Glyptodonts are in the edentate family. Edentate translates to toothless, but they aren’t actually toothless–their teeth simply have no enamel. Of the three only giant tortoises could occupy drier habitat. Glyptodonts and capybaras required subtropical or tropical climate because they both fed upon succulent green vegetation, and they couldn’t survive on winter-killed or dormant plants. Photo of capybaras by a lake shore. Extinct species of capybaras shared the same habitat with glyptodonts. Capybaras are the world’s largest rodent, but during the Pleistocene in North America they were second to the giant beaver. The authors of the below referenced paper suspect a commensal species of bird, like an oxpecker, existed during the Pleistocene and it fed on external parasites formerly found on glyptodonts. Note: I mentioned this specimen in my book but couldn’t remember where I read about it and didn’t include it in my bibliography. I was happy when I finally find this paper which is available online as a pdf download. You are currently browsing the GeorgiaBeforePeople blog archives for November, 2011.